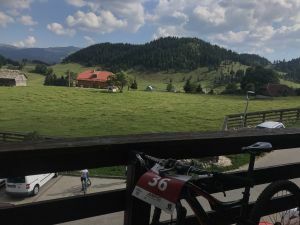 Stage two of the Carpathian MTB Epic started with the same route out of Fundata as stage one this gruelling climb hadn’t become easier overnight which was a shame as my legs pushed hard, body weight over the bars just to keep traction on the front wheel. 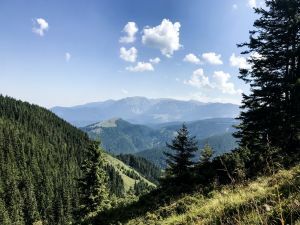 The route climbed a similar path up to the first feed station but today instead of turning left we went right a short sharp climb led to what felt like the roof of the world towering above the mighty Carpathian mountain range, standing still to catch my breath my heart beat was the only sound. The vast wilderness stretched out in every direction un-touched by humans, rugged and wild. Now for the descent! The start was a grassy meadow, with a twist as it was basically a vertical drop, I opted for two feet! This came with the nuisances of flies, which seemed to think I smelt great. I’m sure I didn’t! Once past the rather daunting top section the climb entered the woods and became a whole world of fun, loose earth, roots and switch backs made for technical riding. I kept my eyes up and picked my lines carefully as I swept through the forest my Specialized 29’er making easy progress down the mountain side. We were at the bottom far too quick, a long an arduous gravel road climb took you straight from glory and back to the pain cave for what seemed like an age, as I made my way out of the tree line the rumbles of thunder got louder. decided that my head had to rule and to turn round and back to safety. Reaching the red tent I was surprised how far I had actually climbed. Not stopping at the feed zone I continued on through the rain and wind feeling so cold I just kept pushing, not noticing the time tick by… By the time I realised my lack of eating and drinking it was too late to reverse the damage I had done, it was if someone had switch the power off in my legs and the only gear was slow and painful, I crawled back into the race village. On unpacking my stuff and reflecting it became even more evident why I was I trouble my full camelback told the story, I was so dehydrated my body was just running on nothing. It’s safe to say stage two was a steep re-education in looking after myself. Usually I am so good at refuelling but the conditions got the better of me and then I paid the price hitting the wall 10km from the finish. Stage three I promised myself would go better, and it did! To see more photos head over to my instagram. 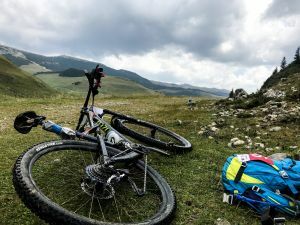 Friday was the first stage of the Carpathian MTB Epic. The day started with a hearty breakfast and plenty of procrastination on my part. After what seemed like an age waiting in the starting box the music fell silent and the loud heart beat timer started our count down, I could feel my heart racing and tried to control my breathing. The starter sounded and the sounds of clicking pedals and gear shifts filled the air as we set off out of the race village towards, what for me, was about to be an awesome day in the saddle. The climbing and heat hit me straight away as the other riders pulled further up the road, I knew I needed to pace myself after all I was here for the enjoyment and adventure not to ‘race’ but as a ‘racer’ that can be quite difficult to get your head round. The course took us through some spectacular scenery we climbed up on to a ridge line, where the first feed station sat, at just over 12km into the race. 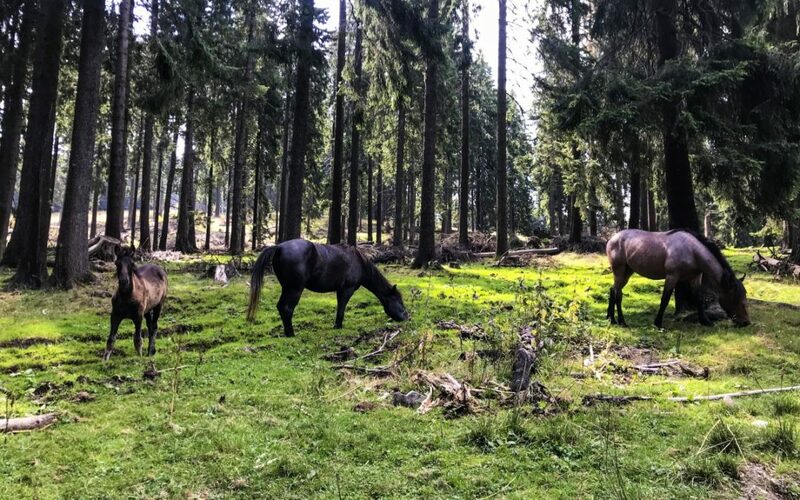 It had been a mixture of ‘hike a bike’ and gradual climbing to get here up fire roads with horses grazing in the woods and loggers hauling huge trees behind tractors. I looked up at the climb to the top of the peak and ate another date, I was going to need all my energy for this one! Once up this short sharp climb the course stayed high and traversed the sky line, the view was incredible! The first proper ‘descent’ felt very steep and loose. The next few hours are a bit of a blur the course continued to be gruelling and amazing at the same time. The clouds had once again pulled in and the thunder in the distance worried me, it was going to get wet, very wet! I stopped and put my rain jacket on and continued my descent towards Feed Zone 2, reaching this I was right to put my jacket on when I did as the heavens open and within seconds everything was washed out, the next section was a road climb which seemed to go on forever, the road had become a river and the rain was making it hard to see. I was relieved to be off the road and back to the gravel; even though this was harder to climb I didn’t have to worry about the cars. 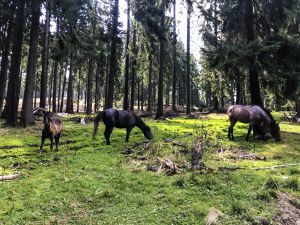 The route meandered through the valley with towering rock cliffs on one side and the open meadows on the other, farmers and their cattle watched on as I slowly made my way around the course following a stream which then became a river to cross before tracking the valley on the other side. I could see little dots behind me, which I thought were cyclists and it felt comforting to know I wasn’t the only one! The climb continued and on reaching the top the huge rock face stood in the distance, you’re going over there said the marshal, wow it looked far away! Continuing along and down I was surprised to reach the rock face quicker than I anticipated proving that all you have to do is keep pushing those pedals and you will eventually make it. The next climb was exhausting and I really began to question the ‘fun factor’, it was a grassy climb and in the wet my shoes kept slipping and it seemed to take hours to reach the marshals who were lovely, they said one little bit of up then it’s all down! That sounded promising. Of course that’s not quite how it went it was more like up, down, up, down, up then down. It was a spectacular descent now on the other side of the rock face and open valley to my left the descent was rocky and challenging I kept my wits about me as I negotiated the rocks enjoying the challenge. 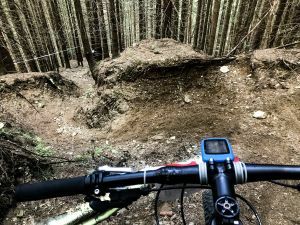 The trail led into the woods where I felt really at home working my way through rooty sections, looking for the best line when the trail was off camber and holding on for dear life when it got rather steep in more than one place! Sometimes the descents would be gradual and then turn steep and committing 100% was the only way to make it down, the descents pushed my ability and belief in myself but time after time I made it to the bottom without coming off. The final 10km was hard work the descent for 4km to the road was a rutted field with steep sections that came out of nowhere the last 5km up the road was a killer, pain seems to be a prerequisite of cycling so I sucked it up and pedalled on. Soon enough the white archway was in site and I crossed the finish line. Stage one down, two to go! Since the Trans Alp in 2016 I have been really keen on riding another stage race. The Trans Alp was so tough both mentally and physically but the highs well outweighed the lows and I have been keen to find another adventure and test my body and mind against the odds. 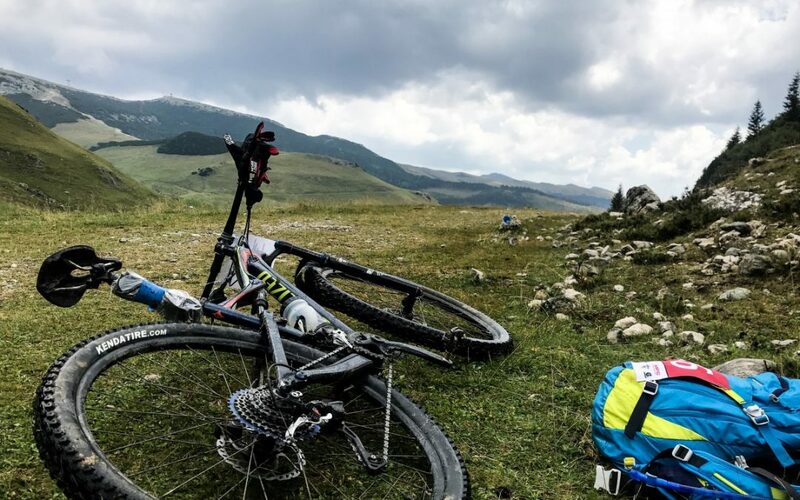 The Carpathian MTB Epic seemed like the perfect adventure. 180KM, 8,100m of lung busting climbing in 4 days, through the land of Dracula in one of Europe’s last genuinely wild mountain regions. How could I say no! This year along with taking on this 4-day stage race my life is a little different to when I did the Trans Alp. Back in 2016 I had no dog to look after and I managed to reduce my coaching right down to just the kids club in order to fit in 12 / 14 hour training weeks. This year that wouldn’t be possible! Luna (my German Shepherd) needs her regular walks and runs and my coaching has been booming. 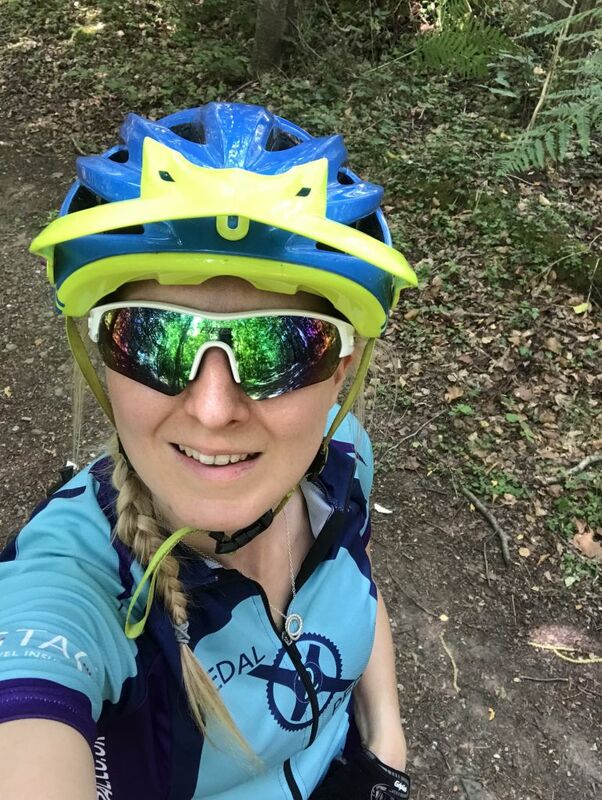 I have this year introduced mountain bike retreats for adults as well as taking Pilates classes, so as you can see life is a whole lot busier than 2016 so 12 hour training weeks are a juggling act! In short I have had to condense my training into one long ride and a sprints or hill session a week. I have also been running and doing kettlebells each week which has helped to increase my muscle strength. Pilates as always is something I do each week and is a great way to strengthen my core and upper body as well as help prevent injuries. 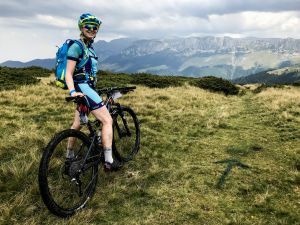 The Carpathian MTB Epic is a full-service event running from 16th – 19th August and is the perfect opportunity for an adventure, even for the time crunched like me. If you hurry up and register until July 29 you may catch a good deal as well. Last day for registrations is August 5, 2018. I started riding in 2012, socially completing the Purbeck hill-a-sarus sportive which I really enjoyed. One day bored, at work I started looking for other events and came across 24 Hours of Exposure, a 24 hour solo event, so I entered, this was to be my first ever race. 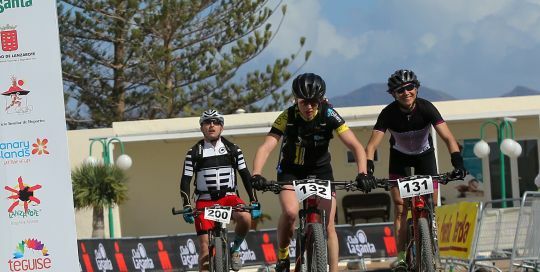 Since then I have tried many different mountain bike race formats, including Solo Endurance races, Team Endurance races, XC racing, Marathon Racing and Multi Day Stage racing. I prefer the challenge of multi-day events and the endurance events. This year along with some Stage Racing I am also doing a 24 hour solo race and a 12 hour solo race and maybe even some XC races! 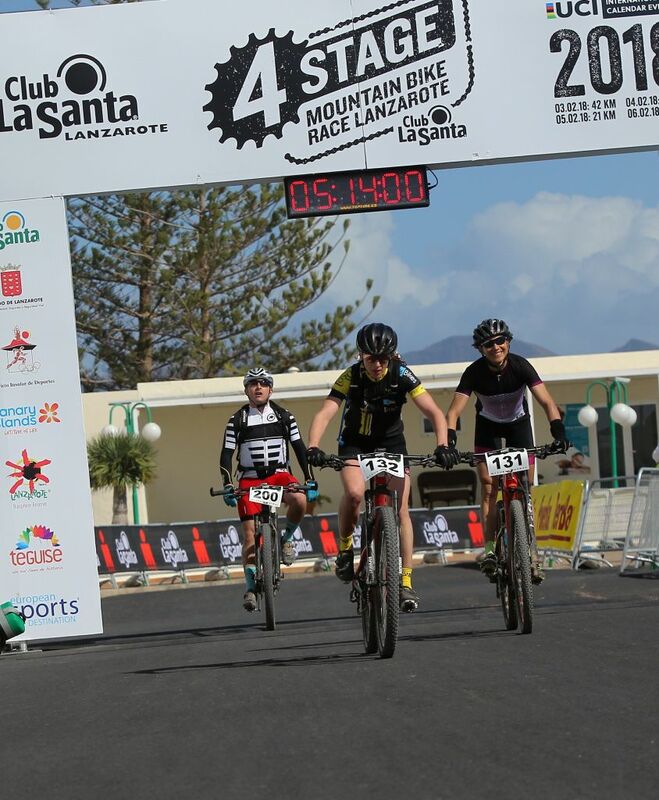 This was my 3rd time doing the 4 day stage race at Club La Santa in Lanzarote, 2015, 2017 and now 2018, why do I keep coming back? It’s a great event, great value for money and something to aim for when its cold wet and miserable in the UK. This year I had the best preparation I have ever had, at the beginning of October I started with a new coach, Sally Bigham, one of the best and most successful stage racers in the world. Sally has been working me hard and I have been putting a lot of hours training in mainly using my Wahoo KickR which is great tool for training especially when training on power and doing quite complicated intervals as it sets everything for you and all you need to do is turn your legs at the right cadence, drink and sweat, a lot! At the end of September I went to the Torq Fitness HQ to do a Lactate threshold test and FTP. The Lactate Threshold was all over as I suspect I was coming down with a cold as I woke up the next day full of cold and the FTP numbers were quite low but I had hardly ridden since Alps Epic due to being away with work for a month, my FTP was 198 Watts, about 6 weeks later this went up to 212 Watts and then on Christmas eve I was out riding and everything felt good so I decided to attempt one out on the road, I was amazed, I had jumped up to 266 Watts, a huge improvement and was feeling really strong, then on the 2nd of January I suffered another Asthma Attack which took around a week to get over and my training in January really took a hit, after that I was away with work again and then busy moving house so prior to flying to Lanzarote I had barely ridden. I had been told not to ride too hard as I hadn’t ridden much in the lead up to the race, I started out nice and steady on the road until we hit the dirt, I felt good so I pushed and pushed and pushed, everything felt so good the bike was great my legs felt strong so off I went, this stage was different to past years so I couldn’t really compare the times but my position amongst the other Brits out told me I had seen quite a lot of improvement so I was very happy. The conditions were tough as well, high winds and cooler than normal made things tough. On Stage Two I decided to ride with my friend Sarah Hewitt, she was sat in 2nd place after Stage One and I knew there was going to be some tough sections on this stage with the head winds so I rode with her and acted as a wind block for her. I really enjoyed working together, we worked hard in tough conditions and she retained second place. About 5km from the end of the stage I had a mechanical, my gear cable had pulled through and I couldn’t shift out of the hardest gear, after a couple of minutes deciding if I carry on in the hard gear or fix it I decided to fix it, Sarah carried on so as not to lose any time, it only took a couple of minutes to fix and I probably lost 5 places by the end, I got back on and set about chasing down some of those that had passed me, I had passed a couple and had caught a British Army rider so I decided to sit in and recover before passing him as I could see Sarah not too far ahead of me, however I switched off a little bit too much and decided to have a lay down in some soft sand, fortunately no injuries bar some bruising to my hip and thigh and somehow I had missed any of the Lava Rock. Again this stage was different to previous years so no comparison could be made to previous years but I was happy with my performance and position and Sarah was still in second place in her category. Stage three is the individual Time Trial, you start on the Beach in Famara and finish on the top of the cliff above. My start time was much later than everyone else so they all got the bus down in the morning and I decided to ride down later as this would act as a good warm up prior to the stage. Again I was still feeling strong and this was the one stage where I could have a direct comparison to previous years, last year I had completed the 22km in 1:38 so I set my self a target time of 1:30. I set off and was feeling strong again, I pushed hard all the way except on the descents, the cross winds were that bad I was being blown of the track and had to slow down and lost some time on these sections. The final climb was tough, with a strong headwind and it was cold, I actually felt very cold in the last 1/3 of the climb, but I pushed on and worked at my limit with an average heart rate of 181bpm and a max of 192bpm. I was over the moon when I crossed the line at 1:22, 8 minutes quicker than my target time and 16 minutes quicker than last year. Stage four is the big one, 84.5km and the route was very similar to last year all be it 2km shorter. I rode with Sarah again which was really good, we jumped between groups in the headwinds, me working on the front as I know I could recover on the descents. 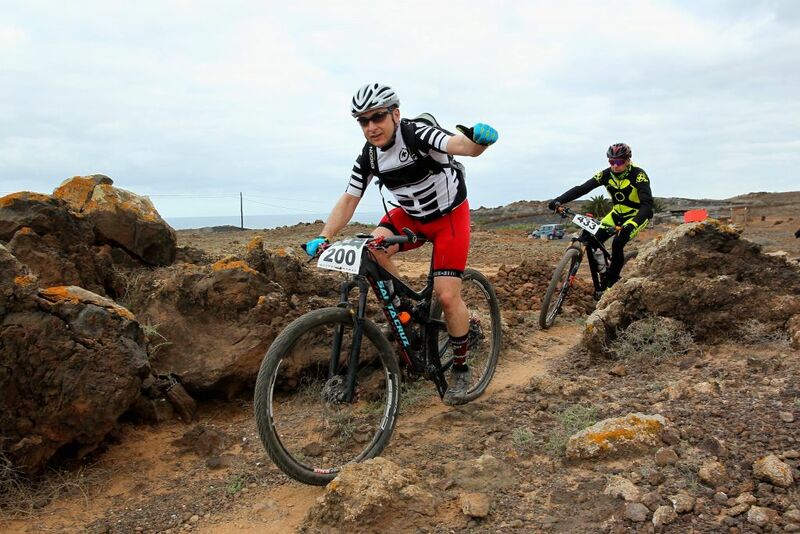 My Santa Cruz Tallboy is the perfect bike for Stage racing, I nice position and I have fitted it with a dropper post which was great for the descents. Part way through the stage there is a 10km climb and leading in to it is a drag on a fire track in to a headwind, I knew what was coming but still pushed hard along here, gaining a few places and catching some riders that were up ahead, I knew Sarah would be stronger than me on the climb but I also knew I could catch her on the descent the other side so off she went into the distance and I plugged away, I was suffering with some lower back pain which didn’t help and the winds were still strong as we climbed, but even with all of this I felt stronger than I had before so pushed on. As I thought I caught Sarah on the Technical descent and waited for her at the bottom which gave me a chance to stretch which really helped and maybe something I should have taken time for earlier… We carried on the stage together and continued to gain places. The last 15km or so were in to a strong headwind so head down and keep pushing, Sarah did say after that she moved to take a turn on the front, pulled out from behind, felt the head win and tucked back in, it was tough and I have never been able to work that hard for that long, as we pushed closer to the finish I spotted two riders ahead and was pretty sure one of them was the lady that was leading the category Sarah was in so I pushed harder, making sure Sarah was still with me but hadn’t told her that I thought her main competition was up ahead, we caught with about 3km to go and passed her and her friend very quickly but she had jumped on the back, the last few Km’s were tight and twisty so I was pushing but trying not to push too hard but also making sure that I hadn’t lost Sarah and was towing the other lady instead, I knew it would be a sprint finish for them so as we came in to Club La Santa I pulled over to the side and let them pass, Sarah took the sprint and the stage and finished second overall. My time for this year was amazing, last year was over 6 hours, this year was 5:12, so a huge improvement for me, would I have pushed so hard if I had been on my own I’m not sure, having someone else to ride for and ride with really pushed me on, now to convince Sarah we need to pair up for a big stage race like the Bike Transalp. I am very happy with my results this year and have seen huge improvements thanks to my amazing coach Sally Bigham, my next big event is Transpyr in June which I will be doing solo, 800km, 18200m’s climbing in seven days. 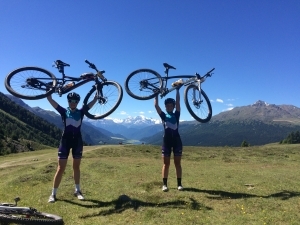 The Trans Alp Bike Race claims to be the toughest amateur Mountain Bike stage race in Europe. 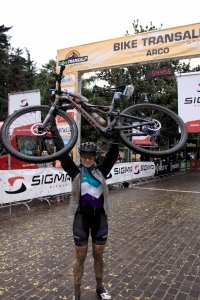 Six hundred teams made up of two riders, set out from Imst in Austria on a seven day epic that ended this year in Arco, Italy. Of the six hundred teams 16 were women’s teams. 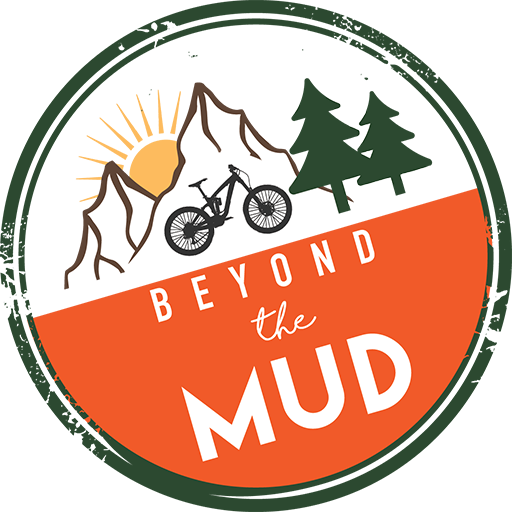 The race is an ultimate test of mountain bike endurance and skill. My team mate Michelle and I spent seven days doing battle up mountain passes, riding along valley floors, passing through tunnels and dropping down breath-taking descents as we crossed from Austria to Italy. We passed through 3 countries, climbed over 17,000mts, the equivalence of climbing the height of Everest twice over and rode 521km. As a team we burnt around 70,000 calories, went through 4 sets of brake pads, ate a lot of water melon at the rest stops, consumed 36 energy gels from High 5 and SIS, 12 bananas, drank around 4.5 L a day and spent 44 hours in the saddle. 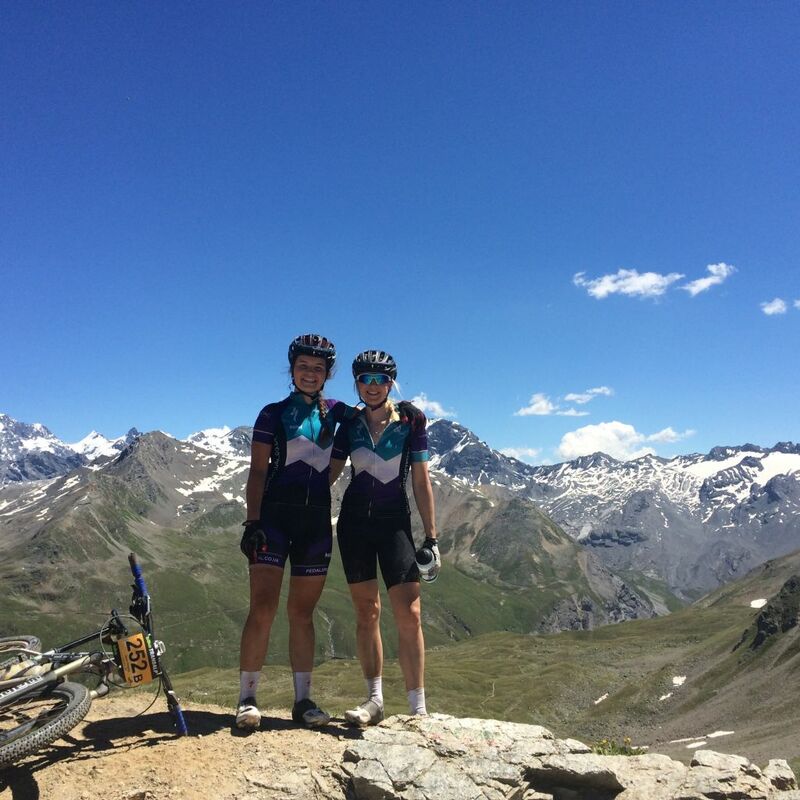 The Trans Alp was far tougher than I imagined, no training in the relatively flat UK can prepare you for exhausting 2,000m climbs that took us over and through the spectacular scenery. After 17 hours of driving we arrived at our B&B and spent Friday relaxing and exploring the trails nearby on our bikes and trying the local pizza. We were being supported by my Dad. Having competed at a high level himself (Kayak Slalom for GB) he was excited to be supporting Michelle and I and also came with vital knowledge on what we would need whether that be encouragement, food, water or just a thumbs up as we raced past. On Saturday morning, I woke with some pre-race nerves and a degree of uncertainty had started to creep into my mind. Could I actually do this? 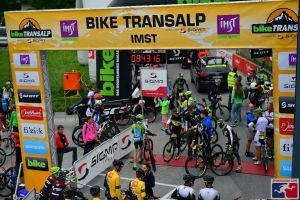 Imst had become transformed in just a few hours from a quiet alpine town to a hive of excitement and activity. Mountain bikers, some already with number boards on the front of their bikes and carrying the massive blue bags with Trans Alp bike race written on them, which would take their clothes, bike spare parts, food etc from hotel to hotel, were heading off to find their hotels for the night. The streets were filled with music, banners and the general excitement. I felt a wave of eagerness myself. This was it, after all the training and planning, we had made it to the Trans Alp start. Signing on was a simple process, and the level of race organisation was excellent. After attaching the race number board and transponder to the front of our bikes we were given pasta party vouchers (each evening the race organised a pasta party to help riders refuel), freebies and of course a big blue kit bag to put everything in to be transported from hotel to hotel. It reminded me of Ride London but on a massive scale! It took me an age to drift off to sleep my head was full of checklists and questions. Were my tyres too hard? Had I got my nutrition right? Would my bottle jump out of the bottle cage? The start was a mass of excited riders all looking for their grid positions. We were assigned into one of five bays, so that the starts could be controlled and avoid un-necessary collisions. 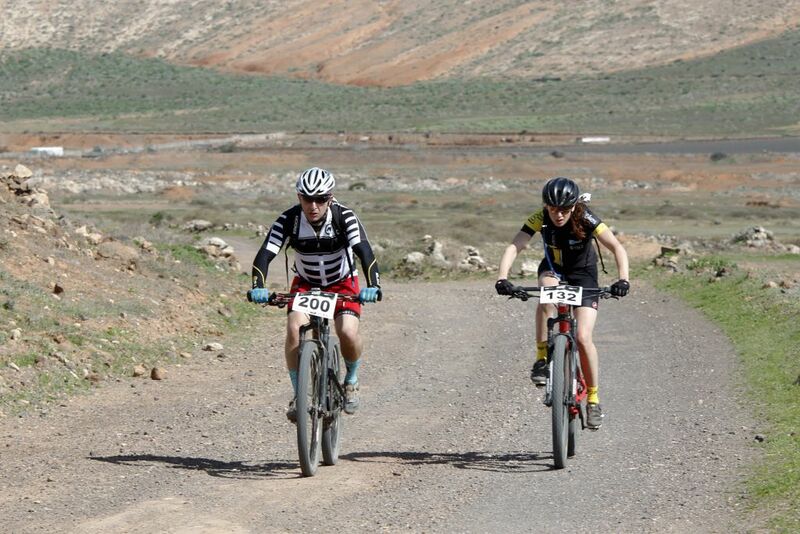 Because Michelle and I had not raced a stage race before we were gridded in D which was at the back. The atmosphere was exciting with music blaring loudly with intermittent instructions being given out over the tannoy system in several different languages. The professionals supported by their teams were on rollers warming up whilst one or two had chosen to wear fancy dress over their biking kit! The race was mainly made up with riders like myself – just looking to finish in the best achievable time, but for a few the prize of winning gave the race a very different edge. This first stage was 88km and included 3,000 metres of climbing along the famous Via Claudia. Having never climbed 3,000 metres in one day before I was in for an interesting day’s work ahead. The climbing was rewarded with the most amazing scenery through the mountain passes. At points after climbing we would sweep back down into the valley and through picturesque little towns full of people cheering which really lifted my spirits and kept me going. During each stage there was a ‘vertical challenge’, timed section of climb. Todays was mega tough as we climbed on a loose fire road. Due to the steep gradient, every now and again my pedal stroke would send my back wheel spinning out. I was not impressed when, after the vertical challenge section ended, I found we still continued to climb! I had thought after the vertical climb there should be a downhill reward! This short, but decidedly diversified stage took us through three countries: Austria, Italy, and Switzerland. The day started with the great news that due to our time on day 1 we had been moved up the start position to from rank D to B! Feeling very impressed with ourselves Michelle and I set off potentially too fast for the 10km uphill which greeted us. One of my favourite parts of every day in the Alps was the Maxxis Enduro Challenge. This was a timed section of the day, usually a downhill technical section. Today’s reminded me of Wales, on a steeper scale with wooded tracks through the forest. The heat was starting to get to me, with temperatures in the thirties I found the uphill sections energy sapping and I had to constantly drink to rehydrate. Having Dad and Tom here for support was proving valuable as they found places on route to give us extra water which I needed. Having someone at the finish line each day to help wash your bike and then find your hotel was also a big bonus of having a support team. Some of the hotels have been out of town and having someone to drive you to the accommodation so you can get showered and stretch off and refuel quickly helped both Michelle and I recover each evening. The routine at the finish soon developed into: washing the bike, washing ourselves, stretching, eating, having a massage and then trying to get your brain which is buzzing with the wonders and efforts of the day to turn off and let you sleep. The morning started at 6.30 am as we clambered out of bed to pack and take our kit bags down to reception so that it could be taken to the next hotel destination. Then, breakfast, the most important meal of the day. Even more so when you’re riding through lunch time! I supplemented my European breakfast of fruit and yoghurt with porridge and also had a few slices of bread with either honey, Nutella or egg depending on what is on offer. Eating so much in the morning is hard but I knew I needed to keep refuelling with carbs if I hoped to make it to day seven! This stage had some of the most breath-taking scenery I had seen. Climbing high over Pass da Costainas the route continued to make its way through the valley on an amazing bit of singletrack which at one point included traversing a steep sided track around the reservoir and crossing a waterfall. 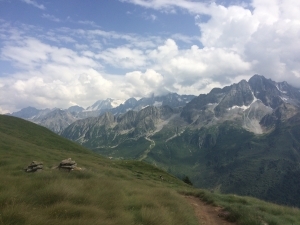 On Day 4 came the longest climb of all, the Umbrail Pass (el. 2,501 m) which is a high mountain pass on the Swiss–Italian border. The road twisted up through the valley climbing for 1,000m with an average incline of 9% until we ran out of tarmac. At this point we were sent off road on a 400m steep climb to the summit of Bocchetta di Forcola. Standing above the snow line was unbelievable. Mountains stretched out as far as the eye could see and down below a trail of ant sized cyclists made their way up to the summit. A breath-taking moment I will never forget. The Queens stage and the toughest day of my Trans Alp experience. I had my first mechanical after my chain jammed 800m off the start. My body then had its first mechanical when my lower back problems reared their ugly head sending pains from my back all down my leg into my foot. By the top of Passo Gavia at 2,600m I was really struggling, I got off and stretched out my back while Michelle kindly waited. This seemed to ease the pain in my leg and foot. 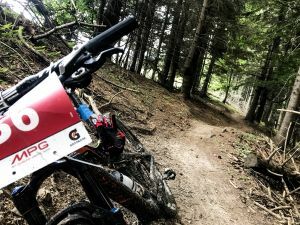 The Maxxis Enduro Challenge section, gave some light relief and a lot of fun which helped me forget the pain as my mind was focused on making my way through the steep rock gardens down to the valley floor. It was over too quickly and we were climbing once more. By the feed station at 45km I was again in a lot of pain and felt overwhelmed by the fact there was still over 40km to go until the finish of the day. It is in these moments we all find out the strength of our character. It was a lonely climb to the top of the pass and I battled a lot of negative feelings in those 5km! As my Dad often says: ‘anyone can do it when it’s easy it’s how we cope when the going gets hard that defines who we are’. I was relieved to see Michelle at the top, she then helped me with my bike up a few steep climbs as she could tell I was in trouble. 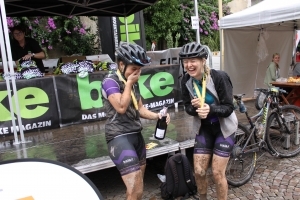 Having a good team mate on a stage race was more important than I realised. Having someone there through the tough times even if just to offer a few words of encouragement makes all the difference. Day six started with some nerves. I was worried about how my back would be when I started hard uphill sections, after the previous day and felt rather emotional about being so close to the finish line. Luckily sleep, Pilates and painkillers seemed to work okay and after the congestion created by the downhill start the long climb was okay and I felt alright if I stayed at a steady pace. Michelle is a better climber than me and at this point had disappeared into the distance. It was nice to see her walking back down to help me with my bike on a steeper section when I was struggling to push up. In a team event it is these little moments of support that keep you going and also bind you together. The highlight of the day was steep woodland single-track. It was challenging but exciting to be off road in such a magical place on single-track which would be pretty impossible to find by yourself. I had to keep an eye on my riding line to avoid boulders hidden in the leaves. 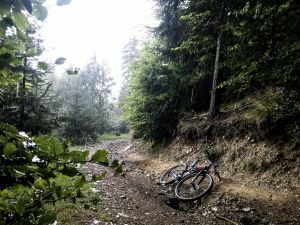 It had been drizzling at times and with hard tyres, because of all the climbing I had decided to run harder tyres, choosing the right line and missing wet roots was critical. 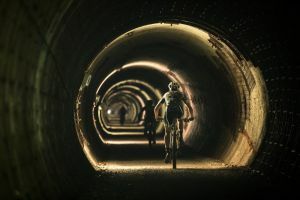 One of the highpoints was riding through a very long dark tunnel where the temperature was so cold it took my breath away. It was really eerie riding from bright sunlight into such a dark place. It seemed to go on forever. A small group of us stayed close together and you could tell no one wanted to be alone in this tunnel! The path then continued to wind through apple groves and vineyards until the final descent which was more like a scramble than a bike track! We had to carefully make our way down the rock face carrying our bikes some of the way, as it was super steep! To my surprise, my body was handling the long days. Pace is key and I had found a race pace I could maintain for the 6-9 hours of continuous riding the days were made up of. The climbing was a lot tougher than I expected but having never biked more than 4 days in a row before I was really pleased to make it to day 6 feeling ready for day 7! The Trans Alp has been an amazing journey, I have been working hard towards this final day for 10 months and the idea that journey was ending was a little overwhelming. So it was with both happiness and sadness that I lined up in Trento ready for my last 54km of this beautiful race. After a dry start leaving Trento, we started the gradual climb up from 200m to 1700m. The climb started on road turning to forest tracks and gravel paths as we gradually wound our way to the top of the pass. I was feeling great, no aches or pains and was actually enjoying the demanding climb. (Clearly I’m getting used to the Alps !) Some sections were pretty steep and with all the rain over night rather slippery too. Once the terrain was more rideable I enjoyed the forest trails which were very like those at home. Although drenched by now my spirits were far from dampened. This after all was just like riding in Wales! The Specialized Era was fantastic, apart from a few gearing issues caused by the 42t sprocket I put on for the huge climbs. 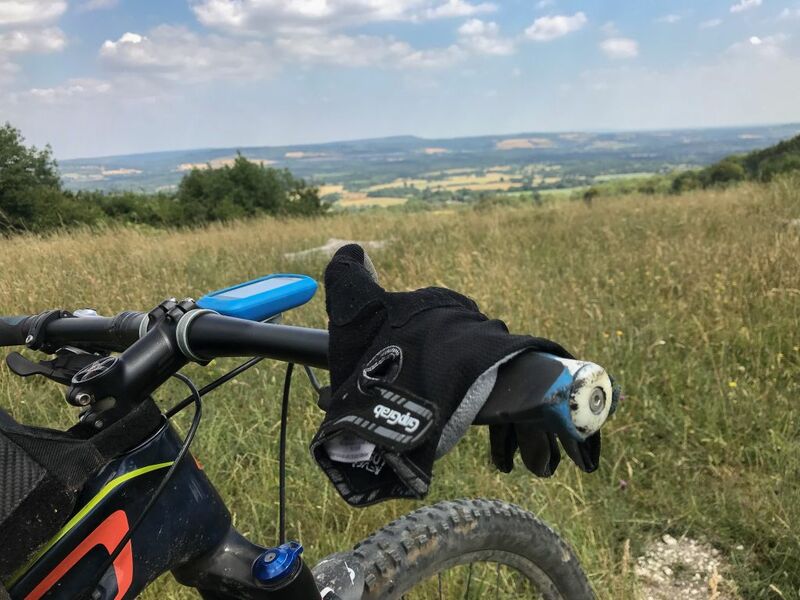 The low stand-over height and rear shock have given me confidence to push myself on the single-track sections and the rear shock helped take the pounding out of climbing and descending which helped my back no end. I have relished pushing myself out of my comfort zone and have found this whole week one long learning curve on bike handling, climbing, team work, nutrition and positive mental attitude! Enjoyed it all. The rain soon set in hard and I was so glad to have my Gore Tex jacket. The feed station at 19km was full of chilly cyclists sipping hot soup, still with smiles on their faces. I didn’t stop for long just grabbing some pineapple and a drinks refill before continuing climbing to the summit at 24km. I reached the top feeling relieved that my last big hill climb was behind me, but sad that I was nearly half way through the final stage. During this race there have been many highs and lows and I have learnt so much about myself, met some wonderful people and have fully immersed myself in the adventure. The downhill section was bone chilling, the first part was grassy paths through steep sided gulley’s, which in the dry would have been great fun, but the rain had made them like ice rinks and together with a group of riders I caught up with, I cautiously made my way down these steep parts. Once we hit the fire road, I enjoyed the sweeping corners singing songs with the word rain in them, as I made my way down to try and keep my spirits high as the rain tumbled from the sky. The feed station at 32km came with a very welcome hot tea and waffles. Just up the road was my Dad, like an ‘angel‘, he stood with dry gloves and arm warmers. I have never been so happy to pull on a cosy warm layer and this really helped get me up what was now my final short climb section in the Alps! At the top of the climb Michelle was waiting huddled with Tom. We finished the final downhill section together. Now we were not as high, it was warm and damp, a little bit like a summer in Wales, so I felt really at home whizzing down the trails looking for the lines which avoided any slippery roots. Racing into the back roads of the town, full of puddles and pot holes and through the final finishing archway was incredible, I felt like I was dreaming. After thinking of this moment for the last 10 months, visualizing what it would feel like to have accomplished my dream – it is difficult to describe how I felt. 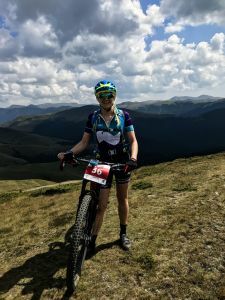 Relieved to have finished climbing mountains for a while, exhilarated to have pushed my body out of the comfort zone and so proud to say I completed the toughest Stage race in Europe! WE DID IT! Thank you to my Dad, all my family and friends who supported me. 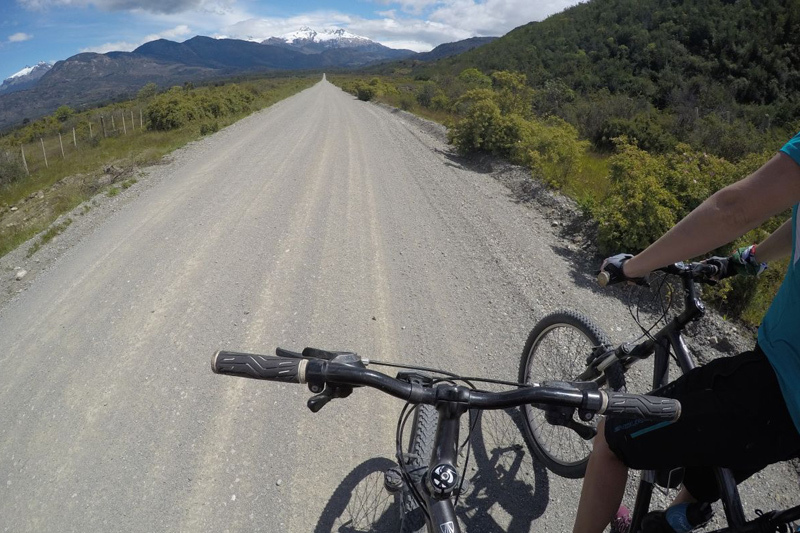 Thanks to Specialized for designing such a great bike – the Era and supporting my adventure. Thanks to Bike Fixers, Grip Grab, Food for Thought and Dogtag for supporting us on this journey of a life-time.